In 2013, I interviewed Jesse Brackenbury, Executive Director of the Rose Kennedy Greenway Conservancy in Boston, for a City Parks Alliance blogpost about the challenges of operating a city park owned by the state – the Commonwealth of Massachusetts. In 2008, legislation established the Conservancy as the official steward of the Greenway. This year, Brackenbury told me, the Conservancy added a new partner to help fund operations of The Greenway – the Greenway Business Improvement District (BID) – which brings the Greenway partnership to four: the city, the state, the Conservancy, and now the abutting property owners. Despite efforts over the years, The Greenway has never been supported by a long-term funding plan. Since its inception, The Greenway has been financed by a series of agreements with the Commonwealth of Massachusetts and supplemented by the Conservancy’s own fundraising and revenue as well as unstructured contributions from abutters. 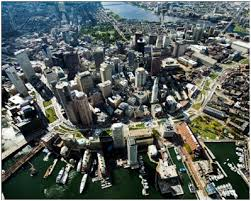 A June 2017 memorandum of understanding solidified six months of discussions regarding a sustainable funding solution involving the Commonwealth of Massachusetts, City of Boston, Greenway Conservancy and commercial property owners. By April 2018, the new BID was created and a plan was in place. MassDOT had been granting the Conservancy short-term agreements for the park property, and under the new collaborative agreement, the state has now agreed to a 10-year lease with two 10 year renewals to the Conservancy. 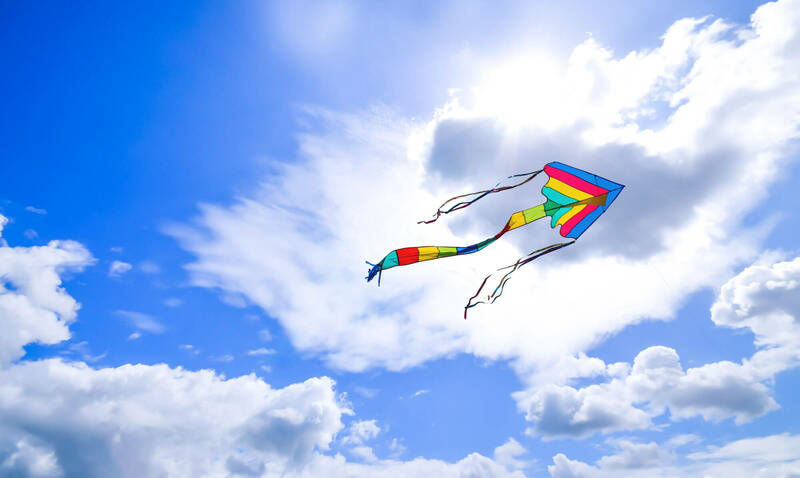 “We now have the stability to engage philanthropists and innovative partners in continuing to improve the Greenway over the long-term,” Brackenbury said. Brackenbury and other Greenway supporters long realized that a BID was a good idea and in fact started working on it 8 years ago. But Boston only had one BID in place and wasn’t yet comfortable with using BIDs to help fund parks; in the aftermath of the Great Recession, conversations about a BID became even more challenging. In 2008, Charlie Baker, a founding board member of the Conservancy and now the state’s Governor, foresaw the future with his comments in a Commonwealth magazine article, “As the value of the land surrounding the Greenway increases, I would hope we would see more enthusiasm from the abutters in the future.” He understood the funding challenge from the beginning and when he became Governor, he saw both the Conservancy and the state’s challenges and created the momentum for addressing the Greenway’s needs. f property owners did not figure out a way to meaningfully contribute to a project that was hugely successful – including throwing off lots of added value to adjacent parcels – the state would stop its contributions. “What made the idea of creating a BID easier to do at this time,” Brackenbury says, “is that the Greenway Conservancy now has a successful track record. 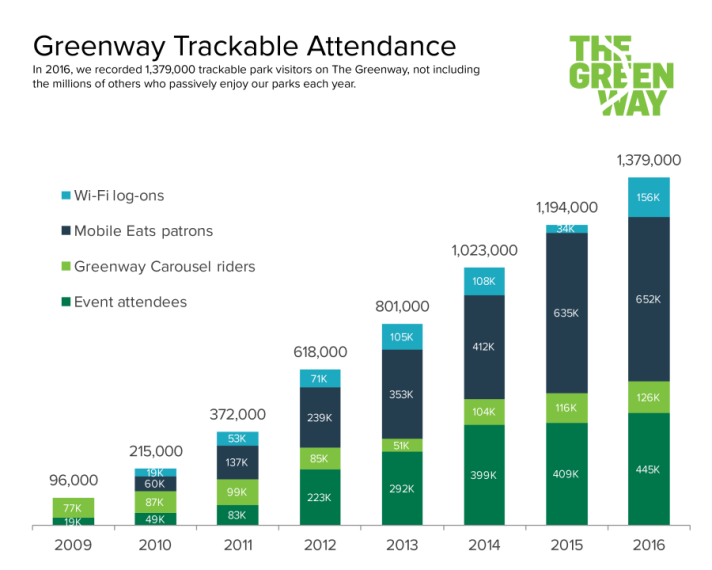 In 2016 we welcomed 1.3 million users and the numbers keep going up.” The Greenway hosts over 400 free events annually and in the last five years the Conservancy has won seven awards from Americans for the Arts for its public art commissions. “Others began to believe that the Conservancy was a credible negotiating partner,” said Brackenbury. Before reaching a city council or other local governing board, a BID effort in Massachusetts must generate support from at least 60% of property owners representing at least 51% of the total asset value within a proposed BID district. The Greenway BID exceeded these legal thresholds by a significant margin, securing support of 82% of owners representing 89% of total asset value. As a result of the negotiations, the City of Boston committed annual funding to the Greenway for the first time. The property owners had also expressed interest in the City contributing directly to care of the Greenway. A planned development project will allow the city a source of revenue to contribute five million dollars, money which has gone into a trust expected to generate $250,000 a year for the Conservancy. So how did the Conservancy make its case in the face of little familiarity with BIDs in Boston? They made the economic case. The conservancy gets credit for re-introducing the idea of a BID and making it a priority. The state has been asking them for a solution for a long time and had been talking about cutting back for a long time but no agreement had been found. If they really stopped providing funding to the Conservancy it would go away and the property owners would be some of the biggest losers with reduced Greenway operations and maintenance. The state’s most recent argument was the most credible that property owners finally took serious. As negotiated, the Greenway BID will contribute $1.5 million to the Greenway each year. The geographic boundaries of the BID will extend approximately one block off the park on either side. The BID will include commercial properties and rental residential properties, consistent with Massachusetts law. 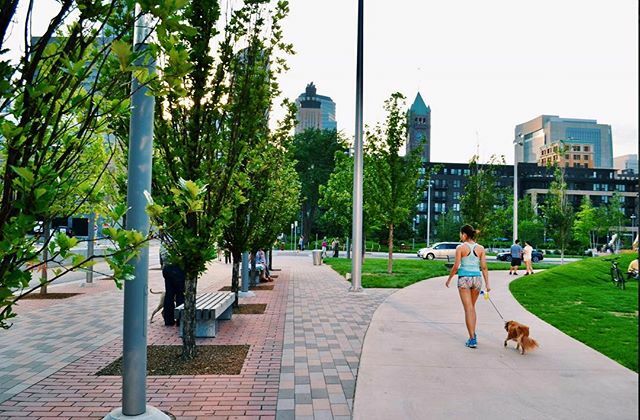 In addition to the BID, the funding agreement for the Greenway includes an annual state contribution of ~$1 million for operations and up to $500,000 in funding for capital repairs; the city will contribute $250,000 annually. The Conservancy will continue to raise/earn $3M+/year. Annual funding for Greenway operations will be approximately 80% private and 20% government funds. “Decision-making about the Greenway remains with the Conservancy; our volunteer Board of Directors has representatives appointed by community groups, government agencies, and elected representatives,” says Brackenbury. “The BID will have nominees in 2 of the twenty-one Board seats. If the property owners are contributing $1 million to maintenance and horticulture they should have a seat at the table.” The Conservancy leads all park services and programming and will continue to do so — in the same spirit of accessibility and inclusivity with the BID in place. “In the first year all BID funds will be for foundational maintenance & horticultural care (M&H) for the park. After the first year, $1 million will be for M&H and $500,000 will be for enhancements to the park.” Greenway enhancements will be mutually agreed upon by the Conservancy and the property owners on the board of the BID Corporation. The funding solution for the Greenway will keep it a vibrant and thriving space welcoming visitors from neighborhoods throughout Boston and beyond. BIDs have emerged as one of the most important developments in urban governance over the past two decades. They are galvanizing private-sector creativity to solve public problems – and increasingly they are taking on public parks. Across the nation, BIDs and other special taxing districts, originally focused on creating safer and more vibrant downtown neighborhoods, are now seeing public space as vital to community and economic development. In New York alone, contrary to Boston’s two BIDs, there are 75 BIDs investing nearly $150 million in public spaces, including the famed Bryant Park with the highest BID budget in the city. The Center City District (CCD) in Philadelphia, established in 1990 enlivens its city and manages Dilworth, Sister Cities, John F. Collins and Cret Parks. 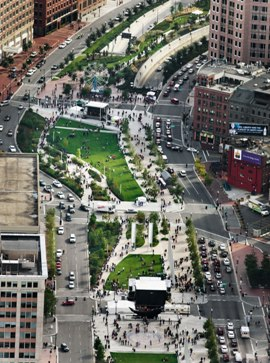 The Downton Detroit Partnership, a BID, operates, maintains, and programs downtown Detroit’s parks — Beacon Park, Campus Martius Park, Cadillac Square, Capitol Park, and Grand Circus Park — providing world-class public spaces that help the city attract businesses and residents as well as catalyze new investment and development. In Washington, D.C., a planning partnership was formed in 2012 between the National Park Service, the District government and the DowntownDC Business Improvement District (BID) to transform Franklin Park, downtown D.C.’s largest park with a sustainable maintenance and operation plan for the park. Earlier this year, Congress approved a partnership between NPS and the District, allowing the DowntownDC BID to move forward with an anticipated annual $750,000 budget to operate and maintain the park. There are no single models for operating and maintaining parks but special taxing districts are increasingly a solution that harnesses the property value – thrown off by successful parks – and the private sector interest in economic development. The goal of BIDs has always been to keep a city’s public spaces in line with private investment – either driving or managing that commitment – to enliven the civic experience. Public parks are very much a part of that experience and the fact that BIDs – existing or new like The Green BID – are choosing to invest in parks is confirmation that their success is important to a city’s image, quality of life and economic development – further driving the role that collective endeavors involving nonprofits, private business and public agencies are already leveraging on behalf of city parks. Previous PostPrevious Summer Festivals in the Park: Too Many People, Too Few Parks? Summer Festivals in the Park: Too Many People, Too Few Parks? Public Place-making and Place-Keeping: Where Do Public Parks Fit In?